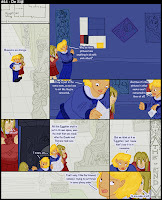 I was pleased to discover a new comic, Alma Mater, over at Modern Tales today. I was surprised to discover it – namely because I hadn’t heard of it before, and MT has a tendency to pretty thoroughly hype new additions to the collective. But there it was, updating 3 days a week, apparently available for mass consumption. With nothign to lose, I took a look – and was rather glad I did so. It wasn’t the strip’s characters that won me over, though they are good, quality characters. It wasn’t the humor, though it definitely had moments where it shined. It wasn’t the art, though I really enjoyed it once I got used to it – and thought was especially cool on occasion. No, what did it was that the creator, Whitney June Robinson, knows her material, and knows it well. Given the name, one can pretty easily extrapolate that the comic is about going to school. But a comic could easily be set in a school without being about one, and in a lot of cases, setting is just that – background material, scenery, nothing more. Alma Mater, on the other hand, perfectly captures a lot of the school experience, and delivers that material brilliantly. It may not have experiences that will tap into absolutely everyone’s memories – what with being set at an all-girls secondary school – but it manages to capture a lot of the fundamentals, and that can be all one needs to connect with an audience, and win them over. Hey there, and thanks for the review! I’m glad you’re enjoying my comic. I do try to treat the school as a character in its own right, so I’m glad that’s coming through. It seems silly to set a comic at a school and never have the characters go to class or work on an assignment, after all.